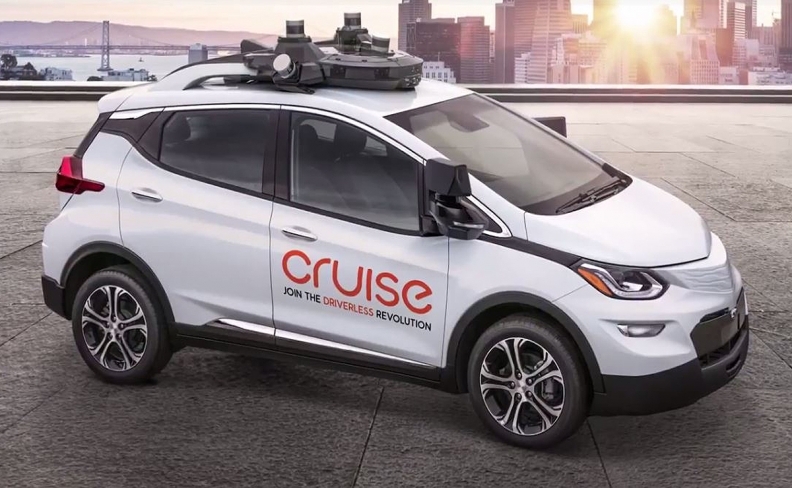 The Cruise AVs, which are based on the Chevy Bolt EV, are the fourth-generation autonomous vehicles from Cruise Automation. DETROIT -- General Motors plans to launch public ride-hailing services with self-driving vehicles that don’t have manual controls such as steering wheels and pedals, starting in 2019. In a petition submitted to NHTSA on Thursday, GM detailed the safety features of the "Cruise AV" vehicle and asked federal officials to allow the vehicles to operate on U.S. roadways without meeting 16 Federal Motor Vehicle Safety Standards that cover vehicles with human drivers but aren’t necessarily applicable for autonomous vehicles. If granted, the waiver would allow GM to launch as many as 2,500 self-driving vehicles a year into a form of taxi service and help pave the way for fully autonomous vehicles to move from niche testing fleets into broader commercial applications. "We're seeking to maintain the same, equal safety but to achieve the safety objectives of some standards in a different way," said Paul Hemmersbaugh, a former chief counsel for NHTSA who now serves as chief counsel for GM's mobility efforts. Under the standards currently in place, Hemmersbaugh said, "we can't achieve them without a human driver or without a steering wheel." One example, according to Hemmersbaugh, is a standard requiring vehicles to have airbags in steering wheels, which wouldn't be possible without a steering wheel. The Cruise AV, he said, has an airbag that mirrors the right front-passenger side that provides equivalent safety. A representative for NHTSA, the nation's top auto safety regulator, didn't immediately respond to requests for comment on the petition. A federal waiver would allow GM to operate the vehicles in the seven or so states that don't currently have laws restricting such vehicles. In other states, the automaker would have to work with local officials to change the rules. The company declined to say where it would like to launch the fleets, which customers would hail via an app and engage with via touchscreens inside the vehicles. GM has announced plans to test the cars in Arizona, California and Michigan. It is expected to expand to New York City in 2018. "We think the technology is going to have a huge impact on the world," GM President Dan Ammann said during a conference call. "Obviously, there will be an adoption curve where people get used to engaging with it and using it." Legislation pending in Congress would allow automakers to seek far broader exemptions from federal vehicle standards for self-driving vehicles and would limit states' powers to regulate the vehicles. Automakers have pushed for a set of consistent nationwide standards to allow them enough scale to perfect the technology, but safety advocates have criticized the pending legislation as too lenient and a risk to public safety. 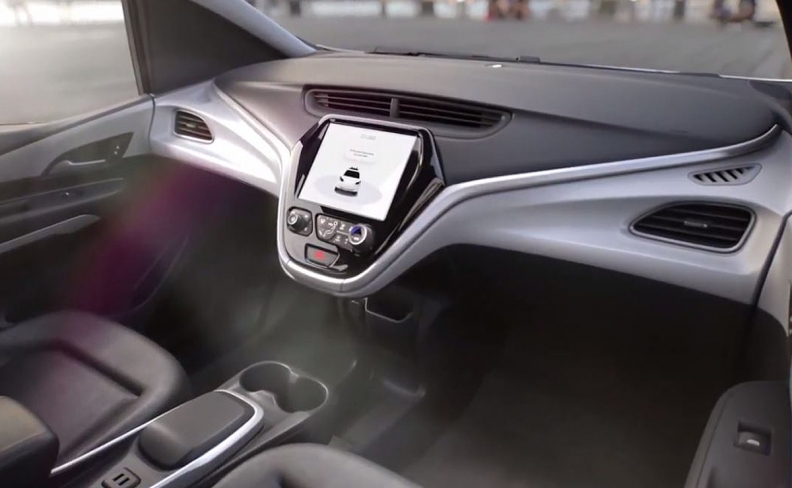 The Cruise AVs, which are based on the Chevy Bolt EV, are the fourth-generation autonomous vehicles from Cruise Automation, a San Francisco startup that GM acquired in March 2016. They feature five lidars, 16 cameras and 21 radars that provide redundant sensing and fail-safes in the event one of the technologies fails. GM released a photo and video renderings of the vehicle Thursday. "In the last 18 months, we've worked to rapidly and iteratively integrate this technology into a production-ready vehicle," said Cruise Automation CEO Kyle Vogt. Cruise has driven "hundreds of thousands of complex urban miles" in the self-driving cars, Vogt has said. GM has announced plans to test the cars in Arizona, California and Michigan. It is expected to expand to New York City in 2018. GM builds its self-driving cars in Michigan at the Orion Assembly plant, which Ammann said has "plenty of capacity" to increase production of the vehicles.